When I was visiting with mom she remembered a salad she had somewhere in Rehobeth beach with a delicious citrus vinaigrette. So we decided to create a Key-Lime Vinaigrette to go with a light seafood salad. It turned out fabulous, even Meat & Potato-sarus dad loved it, so I have since recreated it at home for my slowly transitioning omnivorous-but-ok-with-a-few-salad-based-meals-and-even-a-complete-herbivorous-one-occasionally hubby…. Thaw your shrimp according to directions on bag (mine were overnight in fridge or run cold water over for 2 minutes) and set water on to boil. Cook your corn (2 ears) in boiling water and set aside to cool. Cut off cob. Cook your frozen shrimp in already boiling water from corn (follow directions on the bag). Remove shrimp from water, peel and sprinkle liberally with Old Bay seasoning. Pour about half the vinaigrette over the shrimp and stick in fridge to marinate anywhere from 20 minutes to an hour. 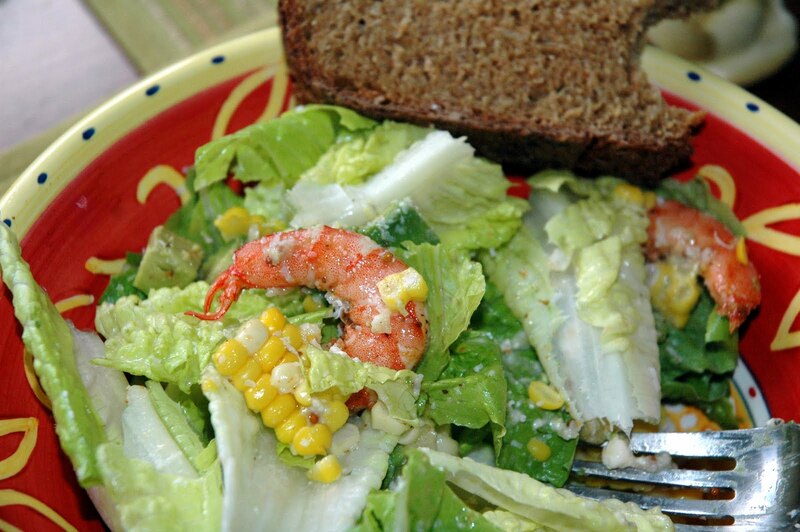 Assemble salad greens, sliced avocado, corn, shrimp, grated Parmesan cheese and drizzle more dressing over as needed. Serve with salsa and crusty bread. Previous PostPrevious Quick Fix: Quesadillas…Heaven in a tortilla.